Almond Maple Pumpkin Muffins make a perfect breakfast! Packed with pure pumpkin puree and low in sugar, they’re great on the go, or for an afternoon treat. Late last night, we baked these almond maple pumpkin muffins on a whim. Having some leftover pumpkin puree from a previous recipe that needed to be used, as well as a handful of almonds that were laying around in the pantry, created these muffins. Since we’re a family of two, this is a perfect recipe that makes 6 large muffins – perfect for breakfast with your coffee or as an afternoon treat at work. Almond Maple Pumpkin Muffins are all what fall is about! Sweet, warm flavors that when combined with the ultimate fall flavor, PUMPKIN, create a muffin that’s rich in spices. As they baked, the entire house smelled amazing! What are some of your favorite fall flavor combinations? Check out the image below for some great ideas on what to pair classic flavors such as pumpkin, apples, and maple! 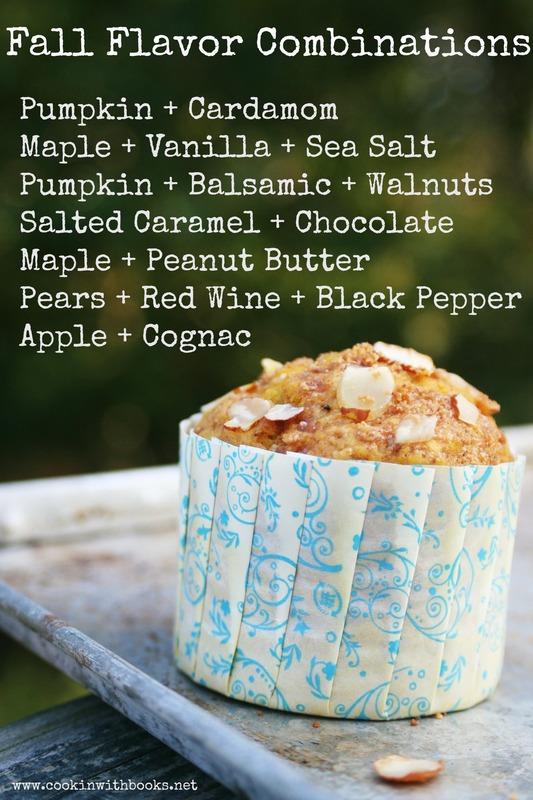 A simple recipe for fall-flavored muffins, low in sugar and perfect for breakfast on the go! Whisk together the dry ingredients. Add the rest of the ingredients expect topping. Blend dry and wet ingredients, but do not overmix. A few lumps is okay. Scoop into muffin liners and top with a sprinkle of maple sugar and almonds. Bake for 12 minutes, or until fully baked. Slightly adapted from The Fannie Farmer Cookbook. Your muffins look delicious and I love those cake cases, they are beautiful! Lovely photographs. I love your compilation of fall flavors! These muffins look great! I am restraining myself from biting into the computer screen, at your gorgeous photos. Love this recipe. It’s perfect for fall! Thanks for all the RTs and blog post support! Hugs, Nella!